Dinosaurs were truly fascinating creatures. They lived on this earth ages ago. But we keep finding out more about them all the time. One can always learn a lot about these creatures on the internet or in books. 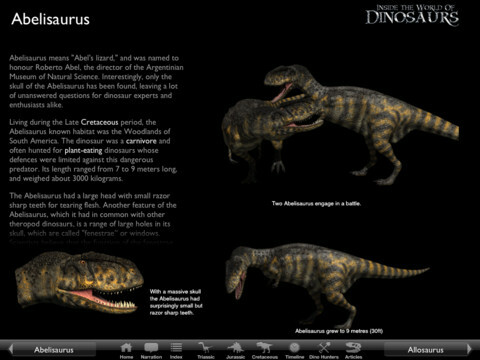 Inside the World of Dinosaurs is an interactive iPad application that helps its users gain a better appreciation for these magnificent creatures. 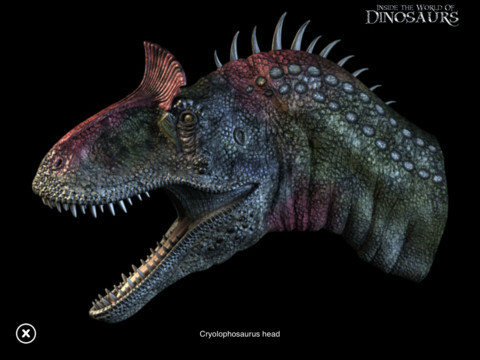 Inside the World of Dinosaurs has 310 interactive 3D models with 200 pages or so of text. You also get plenty of videos and dinosaurs sounds. 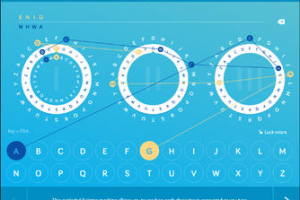 The app includes 5 hours of narration by Stephen Fry. By going through this app, you will not only see how each dinosaur looked like but also learn plenty of background information on each species. Inside the World of Dinosaurs has 60 photo realistic dinosaurs. The 3D models included in the app are quite stunning. It has something for everyone. Whether you are a student fascinated with dinosaurs or want to learn more about these creatures, Inside the World of Dinosaurs has more than enough to get you started. It is not the cheapest app around but is quite interactive and fun.